Click here to buy The Blue Diamond. 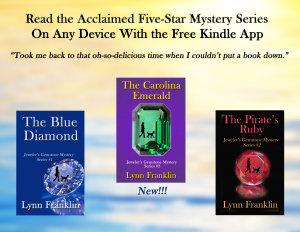 Click here to buy The Pirate’s Ruby. Click here to buy The Carolina Emerald. Click here to order your free bookmarks. *** EBooks available in all countries. Books in the series can be read in any order — though it’s fun to watch the characters grow throughout the series. Love the feel of a paper book? Click here to buy personally autographed paperbacks — available exclusively from the author.